The Puna district was created by the volcanoes Kilauea and Mauna Loa. It is located southeast of the Volcano National Park. In 1986, the road to access it was made inaccessible by lava. Since the road has not been restored yet, it cannot be accessed thru the 130 anymore. The capital of this district is known as Pahoa. It has not been directly affected by lava flow, but to the east, you will find a dead forest named Lava Tree State Monument, which was created in 1790 by a lava stream. The town has an old west appeal. Hilo can be found to the southeast of the Volcano National Park and thru road 11. This capital city is important to Hawaii's economy and education. Hilo is a very wet area and therefore it counts with green and lush vegetation, which makes it ideal for growing orchids, and macadamia nuts, an important part of industry, as these are shipped worldwide. The Mauna Loa Macadamia Nut Company plantation is found here and visited by tourists. Macadamia nut is named after John MacAdam, first to bring it to Hawaii. It has approximately forty three thousand residents. The climate is very humid, wet, and chilly sometimes, the higher you get in elevation, and the colder it is. Hilo has an airport and helicopter tours are available. Two of the best hotels in Hilo are the Hilo Seaside and Hilo Hawaiian. A famous bed and breakfast is the Shipmans Mansion. 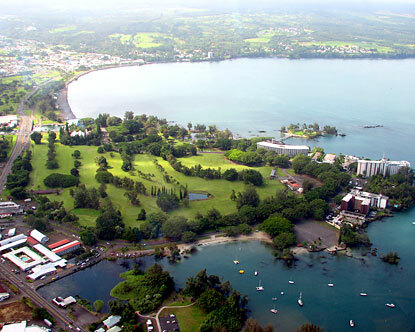 Hilo also has a University, which around three thousand students attend. It is very popular due to its Agricultural programs as well as Marine Science programs. This area is very particular and offers the visitor quite a unique scenery and experience. After a walk thru gorgeous lush greenery, you will encounter a barren field with petrified trees - a masterpiece of ancient lava, which flowed fast covering the landscape and forming unique monuments. It is advisable to stay on the path and not deviate from it. This is not a place that is visited much frequently; therefore, the trails have not been kept up very well. Another warning is to not proceed after the road has ended, as this area is quite active still. The beach is about twenty-five minutes away, but there is danger in proceeding. A near church known as the Painted church that is located back of the main highway is a beautiful sight, unique, boasting Father Everest Gielen paintings, and gorgeous stained glass windows. The priest art made this church unique. Another stop is the Geothermal Power Station dating to the 1970's to research the magma as a possible energy production source. The natives believe that the goddess Pele does not like this type of activity in the area, as it does not revere it. Search Hilo real Estate.